Are you getting ready for Halloween? 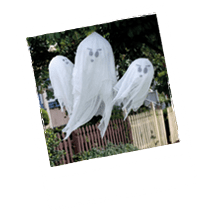 The ghouls and goblins will soon be out and about for witching hour, but we know that you might be looking for things to keep the kids amused before the big day arrives. So why not turn the TV off and have some fun getting messy and making some unique Halloween decorations? We’re getting into the spooky spirit here at The Wigmore with some easy Halloween crafts for kids, great for a rainy day over half term! Take a look below, pick up your supplies, and then get crafting… boo! – Some crafty materials like paint, tissue paper, or fabric – depending on which designs you’re making! 1) Find an empty jam jar or other glass jar, any size you like. 2) Using paint, paper, fabric or a mixture of everything start decorating the outside of the jar. You could glue tissue paper around the outside using PVA glue for a great see-through effect. How about a pumpkin face, or Frankenstein, or a ghost? 3) Leave the jar to dry if necessary, and then use a thick black marker to draw on your scary face or cut your face out of black paper and stick on. 4) Last step is for mum or dad – light a tea-light candle, and put safely into the jar. Then, just turn the lights out and admire your handiwork! 1) Blow up a few white balloons, and then using a thick black marker draw on some ghostly faces. 3) Hang your ghostly balloons from the ceiling with string… boo! 1) Cut out a skeleton skull shape from white paper and draw on a face using black pen. 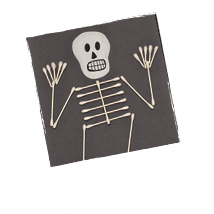 2) Using black card or paper as your background, arrange the cotton buds into the shape of your skeleton – ones with white sticks works best, they look just like bones! 3) Glue down all the cotton buds and the skull when you’re happy – this might be a job for mum or dad! The glue goes easily onto the cotton-tips if you’re using PVA. 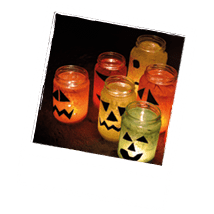 We hope you enjoy having some fun with our Halloween crafts for kids – if you get creative why not send us a photo on Facebook or Twitter? We’d love to see your spooky creations. Have a very happy Halloween from the whole of the Wigmore team!